The last thing Africa needs is a new global war on terror. The memories of large-scale arrests of ‘suspects’, blanket mandates to security forces to hunt down so-called terrorists and random searches of Muslims at Western airports after the 9/11 attacks in the United States (US), led by former president George W Bush, are still fresh in many people’s minds. Faced with the escalating horror of terrorist groups like Boko Haram on the continent, however, there have been calls for strong intervention in the form of military support to the Nigerian army. Some say foreign intervention is necessary to save lives and protect defenceless citizens against massacres like the one in Baga, Borno state on 7 January. Figures are still sketchy as to the exact number of people who died in what has been described as the ‘deadliest attack ever’ perpetrated by Boko Haram, on Baga and surrounding villages close to the border between Nigeria and Chad. Indications are it might not be 2 000, as initially reported, but Amnesty International insists that ‘several hundred’ people have perished. The Nigeria military reports there were ‘only’ 150 deaths in Baga. What is clear, though, is that the threat posed by the Nigerian group is intensifying almost weekly. Data from the University of Sussex Armed Conflict Location and Event Data Project (ACLED) shows that Boko Haram was responsible for around a third of all civilian casualties in conflict in Africa in 2014. A total of 3 428 people fell victim to Boko Haram in 2014, according to ACLED, compared to 1 009 in the previous year. The US-based Council of Foreign Relations’ Nigeria Security Tracker further estimates that 10 501 people have died at the hands of Boko Haram in Nigeria since May 2011. In addition to the terror threat posed by radical groups like al-Shabaab in Somalia and Kenya, as well as al-Qaeda in the Islamic Maghreb and the Movement for Oneness and Jihad in West Africa in the Sahel countries, the escalating violence by Boko Haram on civilians clearly merits drastic action. In the last few days, and especially following criticism that African leaders are commiserating with France rather than Nigeria for its loss of life due to Islamist terror, African leaders have started to speak out. African Union (AU) Commission Chairperson Nkosazana Dlamini-Zuma expressed her horror and outrage at the ‘despicable acts’ perpetrated by Boko Haram. ‘The chairperson is especially horrified by the recent massacre perpetrated in the town of Baga, Borno state, and in a market in Potiskum, north-eastern Nigeria, with the involvement of female suicide bombers, one reportedly as young as 10 years old,’ the AU said in a statement on Monday 12 January. Julius Malema, former African National Congress youth leader and now head of the Economic Freedom Fighters party in South Africa has called Nigeria’s President Goodluck Jonathan ‘irresponsible’, and has called upon South Africa to intervene and ‘fight’ Boko Haram. Anton du Plessis, Managing Director of the Institute for Security Studies (ISS), however, cautions against inflammatory rhetoric that presents Boko Haram as an ‘exceptional military’ enemy to be combated through extraordinary measures. ‘Casting Boko Haram as part of a global jihad movement fighting a war to establish a caliphate in northern Nigeria is exactly what they [Boko Haram] want. They don’t deserve this “badge of honour” and should be treated as serious criminals who are committing horrendous crimes to gain power and territory,’ says Du Plessis. The fight against Boko Haram is not to be won only with guns and rocket launchers, but rather with more holistic counter-terrorism measures that respond to underlying causes and respect the rule of law, he adds. President Jonathan prefers to present Boko Haram as part of a global terror organisation because this draws the attention away from Nigeria’s own responsibility in the situation, says Du Plessis. Last year, for example, Jonathan travelled to France to meet with his neighbours in West Africa on the Boko Haram threat, which has been presented as part of a global jihadist movement. Jonathan is not the only West African leader linking the terror movement in his own country to a renewed global war on terror. Malian President Ibrahim Boubacar Keïta was seen marching alongside French President François Hollande at the symbolic march of over 40 world leaders in Paris on Sunday 11 January, following the recent terror attacks in the French capital. In 2013 France intervened militarily in Mali to drive out Islamist armed groups that were occupying the north of the country. 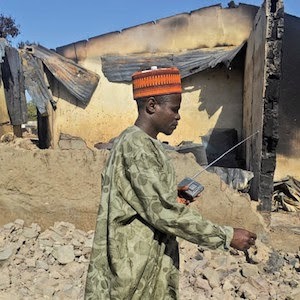 Increasing attacks against villages in Cameroon confirm that Boko Haram has shifted its focus from local access to power in north-eastern Nigeria, mainly in Borno state, to targeting anyone who stands in their way. Links between Boko Haram and other groups in the Sahel have also been established. Du Plessis, however, says only looking at a short-term solution to fighting terrorism in Africa could backfire. It could lead to a harsh reaction by African governments who will use the opportunity to settle scores in the name of a new war on terror. This could in turn provoke certain groups who already feel marginalised. ‘Overreacting now will just create a recruiting tool for Boko Haram,’ says Du Plessis. One of the reasons for the radicalisation of Boko Haram in 2009 was the extra-judicial killing of its members by Nigerian security forces, notably the killing of the group’s first leader, Mohammed Yusuf. Human Rights Watch and others have over the years raised the alarm about human rights abuses perpetrated by the Nigerian army and police. ISS research also shows that one of the reasons given by Kenyans who have joined the radical group al-Shabaab is the harsh reaction by the Kenyan government against terrorism. Du Plessis says it is clear that the insurgency is deeply rooted in local issues such as the distribution of resources, corruption and lack of development in remote parts of northern Nigeria. These factors, together with the marginalisation of the youth, create a fertile recruiting ground for groups such as Boko Haram. The same could probably be said of terrorist groups elsewhere, even in France. Discrimination against North Africans in France, pushed to the margins of society in poor suburbs, the so-called banlieues, is a well-known phenomenon. More fighters for the Islamic State in Syria and Iraq (ISIS) come from France than any other European country. One should add, though, that not all of these fighters are from North African origin or come from poor suburbs. While addressing the root causes, African governments and the AU can use existing counter-terrorism strategies to address the threat. The Economic Community of West African States developed a counter-terrorism strategy that was adopted by heads of state from the region in 2013 in Yamoussoukro, Côte d’Ivoire. This could be a useful tool in the current context, yet it is never mentioned. ‘Why did they spend so much time and money developing the strategy if it is not going to be implemented?’ asks Du Plessis. The AU also has its own counter-terrorism mechanisms. During a special summit on terrorism in September last year, the organisation called on states to implement additional strategies to combat terror on the continent. This includes greater cooperation in intelligence gathering and regional counter-terrorism units. Not much has come of this, and none of these measures are even mentioned in the current debate – not by African governments, nor even the AU. Outrage against the Nigerian government for not protecting its citizens is mounting across the continent. Meanwhile, Nigerian politicians are campaigning countrywide in the run-up to hotly contested elections on 14 February. Both leading candidates, Jonathan and his opponent, former military leader Muhammadu Buhari, claim that they will win the war against Boko Haram if they are elected. Nigerians and the rest of the world are keen to see how this is going to happen.